For three years Justin Matthews has given daily educational wildlife presentations at Mixon Fruit Farms; the 47-year-old owner of Matthews Wildlife Rescue uses the enclosures at Mixon to house some of his rescued animals that would have difficulty returning to the wild. But the bond goes much deeper. Fear of animals is not something that Matthews possesses. Whether it’s Cosmo the great horned owl, Tank the tortoise or Wally the eight-foot alligator, Matthews treats them all like puppies and kittens. One thing Matthews is afraid of, however, is Burmese Pythons. But he’s not afraid for his personal safety; he’s scared for the residents of Florida. Hold on. What was that last part? That’s right. Matthews is the guy who made international news when he planted “Sweetie” — the 14-foot wicked-mean python he plays with in his backyard — in a two-foot-wide, 60-foot-long tunnel, and then called the news trucks over to watch him push it out the other end. The staging succeeded in capturing headlines, but it also landed Matthews in some hot water. 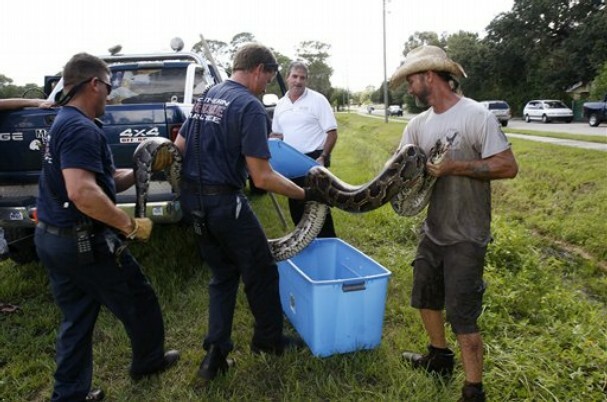 A number of charges may be filed against Matthews for the incident, including a misdemeanor for the misuse of 911 emergency services and another for not having a microchip implanted in the snake, which has been required under Florida law since last year. A full list of charges is expected to be released by the state attorney’s office in coming weeks. We’ll post that info at CLSarasota.com as soon as it becomes available.